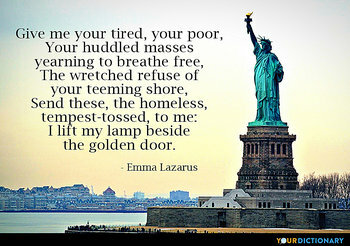 give me your tired, your poor, Your huddled masses yearning to breathe free, The wretched refuse of your teeming shore, Send these, the homeless, tempest-tossed, to me: I lift my lamp beside the golden door.  From 'The New Colossus', inscribed at the foot of the Statue of Liberty, New York harbour,1883. Why should we not boycott the Soviet Union and its supporters inside the country? If we do so, we can force them to review their stand. Either they give us what we want and what is necessary or they will lose our friendship. give them great meals of beef and iron and steel, they will eat like wolves and fight like devils.  William Shakespeare, Henry V (c. 1599), Act III, scene 7, line 161.  1941 Song 'Chattanooga Choo Choo', featured in Sun Valley Serenade (music by Harry Warren). It is praiseworthy when you give not only to your power but beyond your power.  Thus Spake the Holy Mother (p. 78).  The Guardian, December 9, 1995, p. 2. I was a mere tourist with no part whatever in this great conflict; but it was my rare privilege, through an unusual train of circumstances, to witness the moving scenes that I have resolved to describe. In these pages I give only my personal impressions; so my readers should not look here for specific details, nor for information on strategic matters; these things have their place in other writings. Giving offers us the opportunity to reshape our destiny. When you give, you are reshaping your destiny. Society is undergoing a silent revolution, which must be submitted to, and which takes no more notice of the human existences it breaks down than an earthquake regards the houses it subverts. The classes and the races, too weak to master the new conditions of life, must give way.  Letter to Bushrod Washington (15 January 1783). God is like a barber: don't expect him to give you a haircut, you must first get at his barbershop.  Swami Tapasyananda, Swami Nikhilananda. Sri Sarada Devi, the Holy Mother; Life and Conversations. p. 344.